Ace of Bingo offers bingo with a twist, and is the newest online bingo site to join the Virtue Fusion network. The brand promises something new and exciting, and so much more than an ‘average bingo experience'. So prepare to enter a ‘whole new world of gaming with a twist! When you first step into the stylish pink-themed site, a lucky leprachaun will greet you with an awesome welcome bonus. He will also reward you for your loyalty with a whole host of sparkling promotions. You can then ace your way to big winnings and enjoy an explosive mix of entertaining mix of bingo and slots games. When you roll into your new adventure, you can get the best of both worlds with an awesome bingo and slots welcome bonus. So when you sign up and deposit, you can pick up a £15 bingo bonus & £10 slots bonus! That's not all, as you can enjoy ALL of the games for FREE for a full week! You'll also be rewarded with daily promotions, prize night specials and themed offers like the £250K Weekender. Ace of Bingo offers over 30 incredible bingo rooms. The collection ranges features 75 ball, 80 ball and 90 ball bingo in 30 bingo rooms. You can also enjoy Free Bingo, Speed and Pattern bingo! 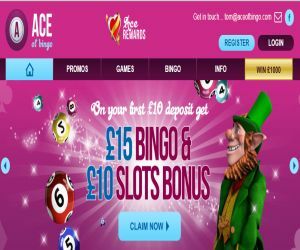 PLUS, if you prefer slots and instant games, Ace of Bingo promises over 150 of the most popular for you to choose from. You can play all of your favourites, including Clover Rollover, Dynamite Digger and Fluffy Favourites. Simply spin to win and you can start making your millions in some of Ace of Bingo's massive jackpot games! Ace of Bingo offers several levels that you can complete to move up and win prizes. Firstly, you begin you journey at Ace of Bingo as a Club and can climb up the rank ladder to Diamonds, Hearts, Spades, VIP and the highest level…. the Ace of Bingo! Each time you finish a level, you can work your way up to the grand prize – becoming the Ace of Bingo and taking home £1,000 cash! You can also tailor the levels to your game preferences, and will be rewarded for playing your games of choice. That means that you will never be asked to bet on a game that you are unfamiliar with in order to get to the next level. So whether you fancy bingo or slots, you will get your rewards for the games that you recognize and love. Simply play your fave games, move on up those levels, and you'll be winning that £1,000 cash prize in no time!